As my CV illustrates, my research focus for much of my career has centred around teaching and learning, particularly with the respect to the history of courses on national literatures at the post-secondary level. More recently, my conference presentations have focused on educational development, though I continue to write and publish about literature. Winner of the 2013 Gabrielle Roy Prize (English) for best work of Canadian literary criticism published in English. 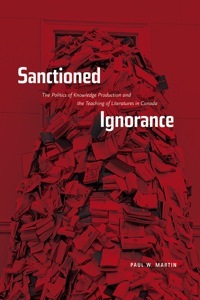 Sanctioned Ignorance examines in both practical and theoretical terms how department structures, course structures, and the history of institutions and academic fields profoundly shape the types of knowledge that we work to produce in the classroom. “La force d’y croire: The Literary Battles of Georges Laraque.” The Same, but Different: Hockey in Quebec. Eds. Andrew Holman and Jason Blake. Montreal: McGill-Queen’s University Press, 2017. 209-236. “Publish (Openly) or Perish: reinventing academic publishing in the wake of the University’s collapse.” Alternative Futures to What We Now Call Publishing. Edmonton: Book Publishers Association of Alberta. June 2012. “The Unworkshop: Addressing What Matters Most to Faculty.” 42nd Annual POD Network Conference. Montreal, October 25-29, 2017. “The Unworkshop: a Gateway for Responsive Faculty Development and Student Learning.” Society for Teaching and Learning in Higher Education Annual Conference. Dalhousie University, June 19-24, 2017. “First Day Boot Camp Show and Tell: How We Moved Beyond Discussing the Syllabus.” Society for Teaching and Learning in Higher Education Annual Conference. Vancouver. June 16-19, 2015. Co-presented with Daniel Braun and Carolyn Ives. “Open Secrets: Building a Culture of Open Learning (and teaching) in Courses on the Literatures of Canada.” 2015 Annual Meeting of the Association des littératures canadiennes et québécoise/Association of Canadian and Québécois Literatures. University of Ottawa. May 30-June 2, 2015. “place(s) where time and space have a different rhythm:” Hockey, freedom, and Confinement in Richard Wagamese’s Indian Horse. 31st Annual Conference of the Sport Literature Association. University College of the Rockies, Cranbrook, BC. June 25-28, 2014. “The Disappearing 19th Century: English courses on the literatures of Canada 1997-98 to 2007-08. 2014 Annual Meeting of the Association des littératures canadiennes et québécoise/Association of Canadian and Québécois Literatures. Brock University. May 24-26, 2014. “Fraying the Edges: Changing the Fabric of the Institution One Faculty Member at a Time.” Co-presented with Carolyn Ives. Educational Developers Caucus Annual Conference. University of Calgary. February 19-21, 2014. “The Last Best West: Lessons from the Pioneer Days of Teaching (and Selling) the Literatures of Canada Online.” 2013 Annual Meeting of the Association des littératures canadiennes et québécoise/Association of Canadian and Québécois Literatures. University of Victoria. June 1-4, 2013. “Surfing the Waves of Disruption: faculty development in the age of the open, online course.” On the Verge: Debating the Future of University Teaching. Seventh Annual Conference on Teaching and Learning. University of Windsor. May 1-2, 2013. “Worrying about resistance is futile, or, if certain people are complaining there is a good chance you are doing something right: social media as a disruptive force in Canadian Studies.” 21st Association of Canadian Studies in the United States Biennial Conference. Ottawa. November 16-21, 2011. “Pop Goes the Textbook: Reflections on the role of pop culture topics (like hockey) and forms (like the comic book) in university curricula. Co-presented with Richard Harrison. 2011 Centennial Symposium on Scholarship of Teaching and Learning. Banff, AB. November 10-12, 2011. “The End(s) of ‘Canadian Literature.’” Reasserting the National? Questioning Origin(al)s in Canada. University of Toronto. May 14-15, 2010.